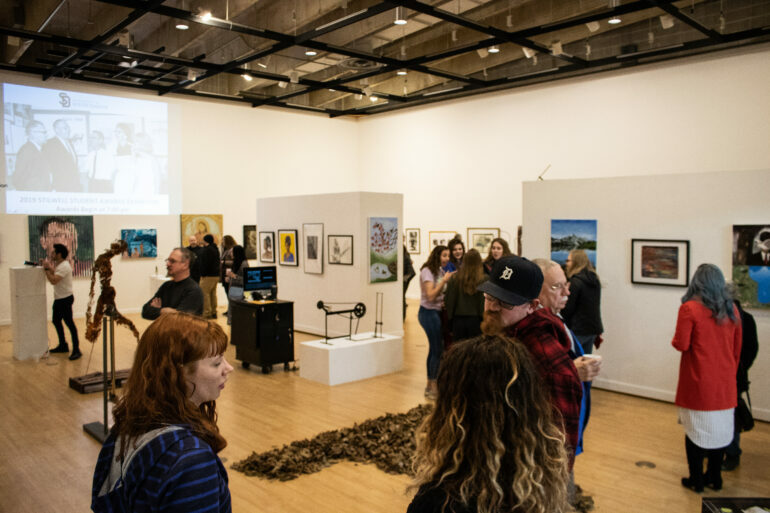 USD community members from all corners of campus gathered on Friday night to celebrate the opening of the 33rd annual Stilwell Student Awards Exhibition. The Stilwell Student Award Exhibition is an annual exhibit that celebrates and recognizes USD students’ work. The exhibit features student work from each discipline including graphic design, photography, ceramics, painting, printmaking and more. Courtney Lavallie, a USD alumna and this year’s gallery assistant, said the exhibit is a good professional experience for students. “I think it just gives the students a chance to all get their work up in a gallery and get the opportunity to showcase their work and be a part of an exhibition,” she said. Since Lavallie graduated in December, she had art featured in the exhibit. “Previously when I was still a student, I worked in the Oscar Howe gallery across campus and then I graduated in December, and they kind of had a switch in gallery directors and Amy approached me after I had just graduated and asked me if I wanted to be the gallery assistant,” she said. The Gallery Director, Amy Fill, said the exhibit is special because art is usually a solitary experience, so it is special for students to come together and see each other’s work. She also said it is unique for the students to see works from different disciplines and not just their own. Junior graphic design major, Courtney Moffat, had two pieces in this year’s exhibit. One piece she started as a freshman. Students can visit the Stilwell exhibit from Jan. 24 – Feb. 24.